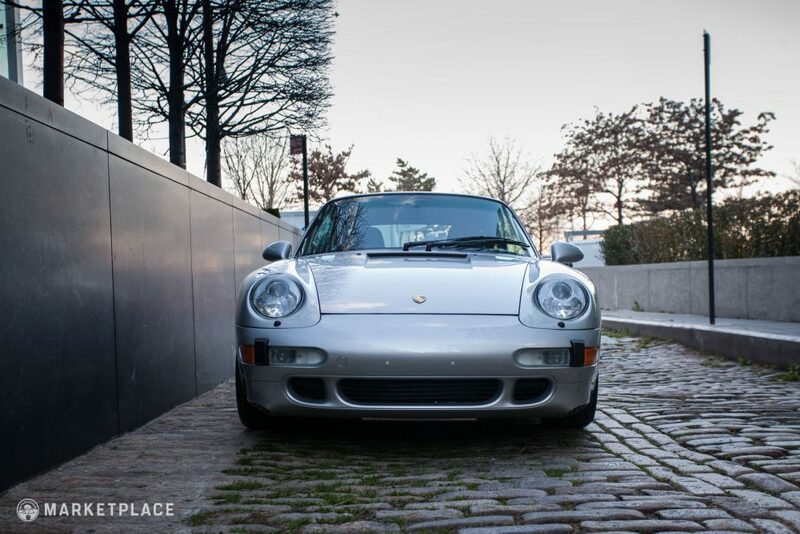 The majority of Porsche purists will proclaim that the 993 chassis was the last of the original 911 ideology. 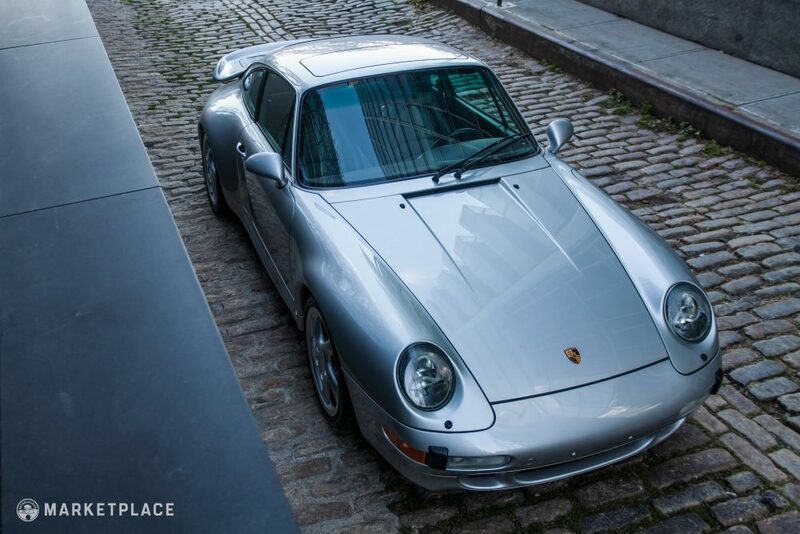 Not only is the 993 the last air-cooled 911 model, but its cabin and greenhouse blueprints were carried over from the 964—meaning the 993 has “proper” proportions according to Porschephiles. 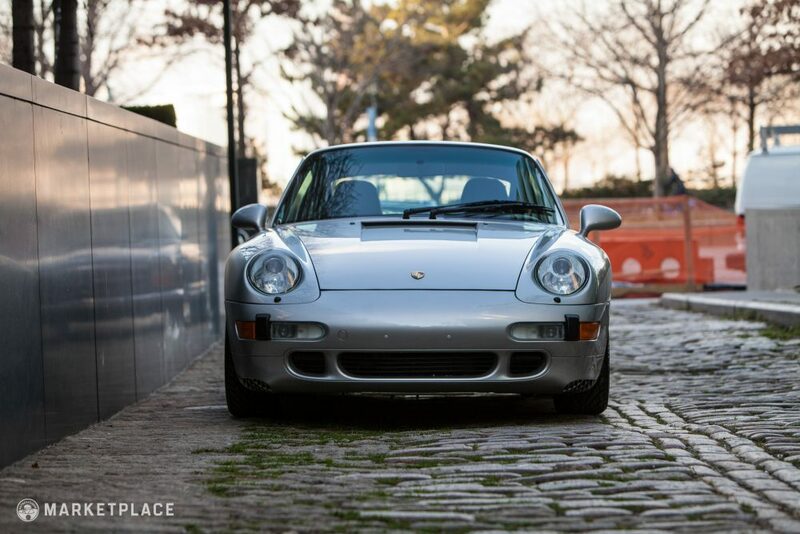 Although the 993’s successors set new performance benchmarks, there’s something to be said for the car’s ability to retain a classic aesthetic while offering truly modern capabilities— especially considering the top-of-the-line 993 Turbo’s screaming zero-to-60 sprint of just 3.7 seconds. 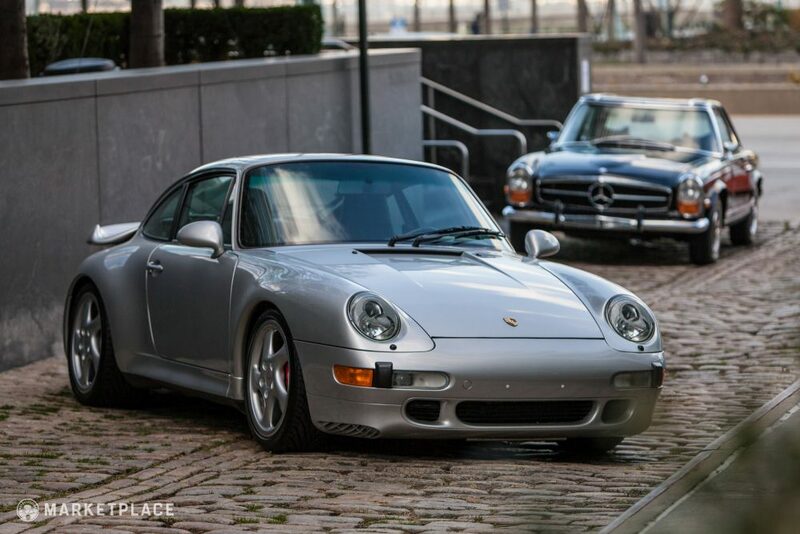 Despite its traditional look, the standard 993 911 received an estimated 80-percent-new engine design when compared to its 964 predecessor. 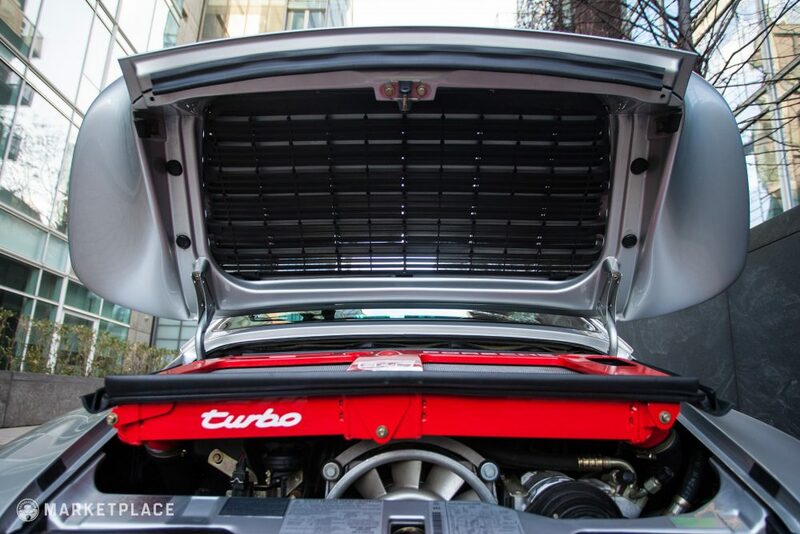 With the Turbo’s 1995 debut, the public saw the bespoke forced induction power plant producing north of 400 horsepower and 400 pound feet of torque for the first time. 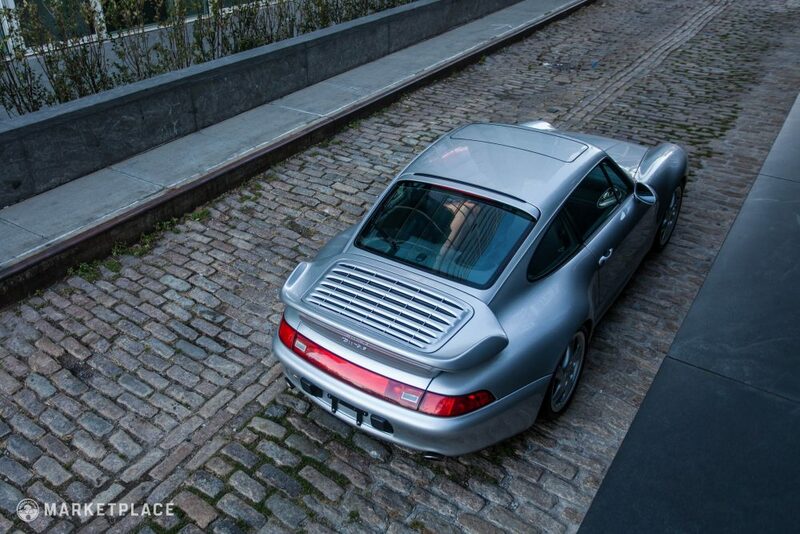 An all-new six-speed manual transmission was standard as well— a first for the 911. 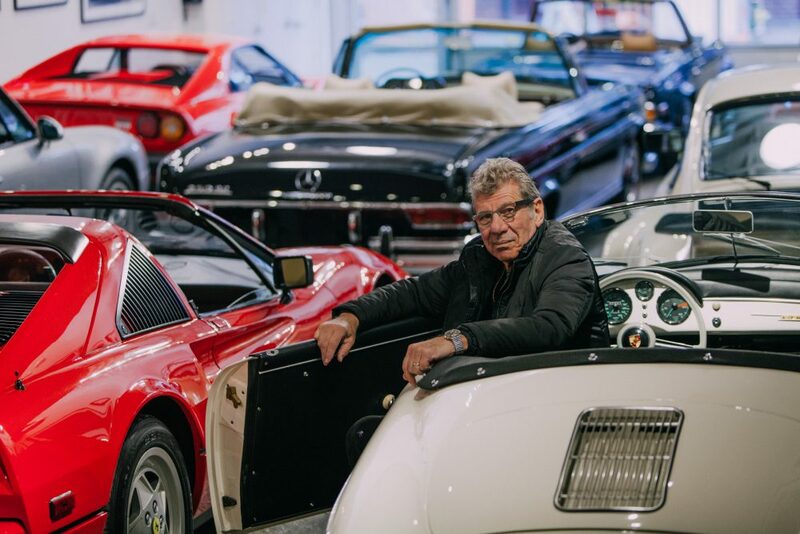 Thanks to its state-of-the-art electronic engine management system, the new Turbo was more responsive and faster while being simultaneously more fuel efficient and eco-friendly. 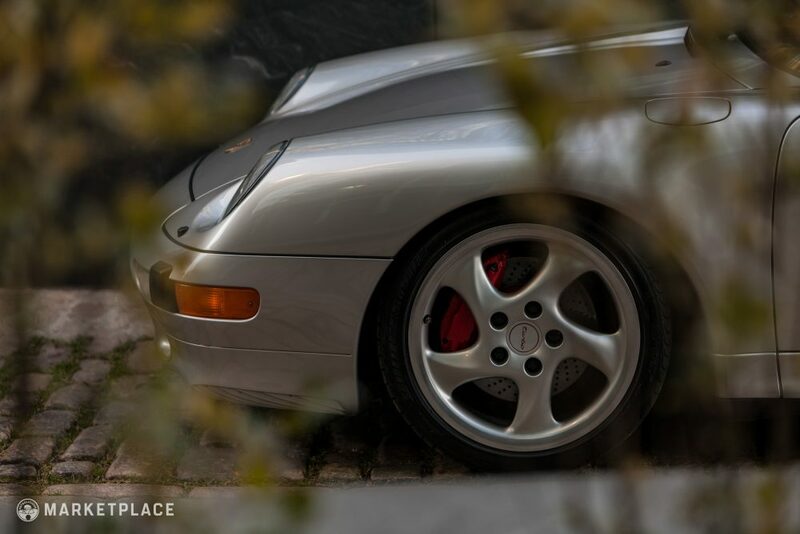 To help convert the new colossal power output into forward velocity, the 993 Turbo received a trick all-wheel drive system descending from their groundbreaking work with the 959. 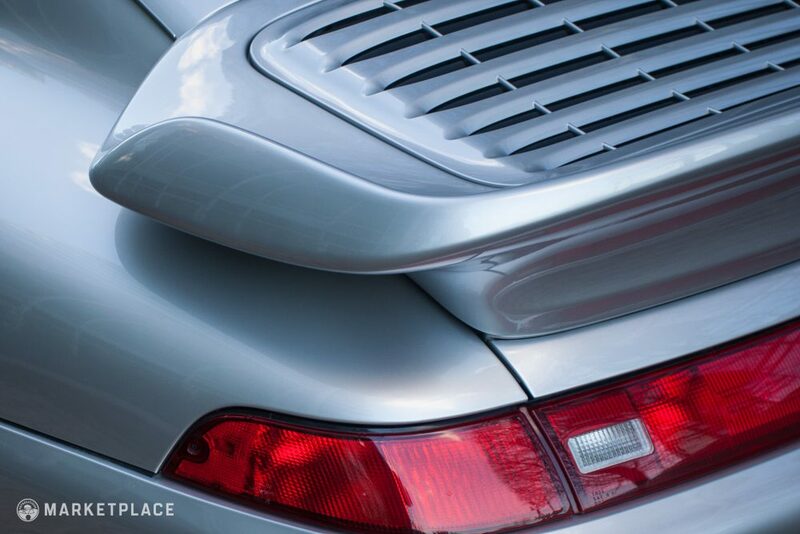 Undeniably quick, unfiltered, and more responsive, the 993 Turbo significantly raised the performance bar while remaining firmly rooted in the air-cooled 911 tradition. 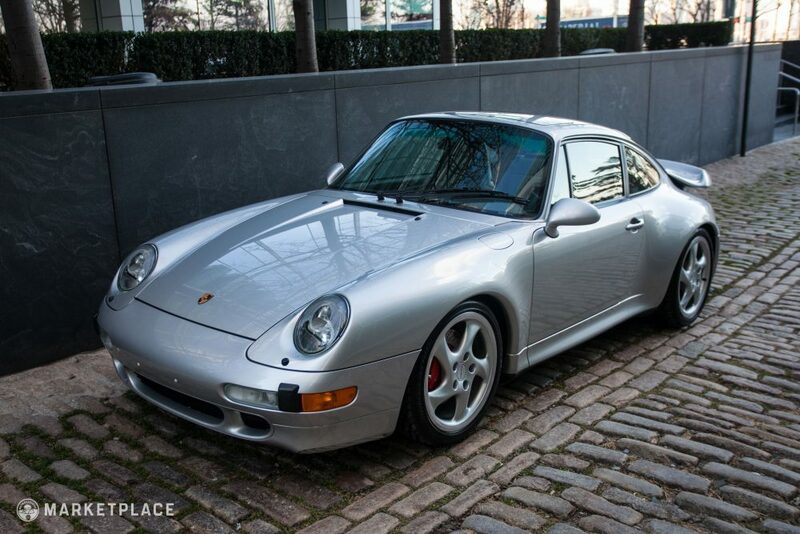 With the cabin heavily based on the 964 – the doors, roof, and glass remain classic 911 – the rest of the bodywork was totally revised for the 993. 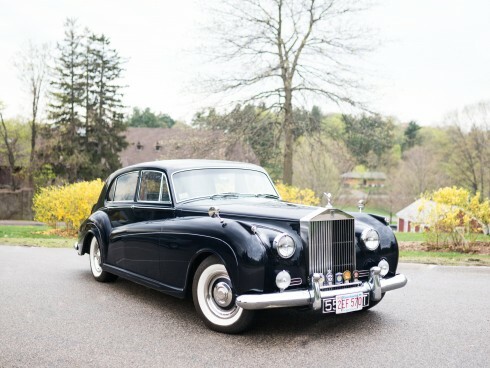 The front fenders and rear quarters were greatly widened and the front and rear bumpers, taillights, hood, headlamps/bezels, and rear deck lid were completely redesigned. 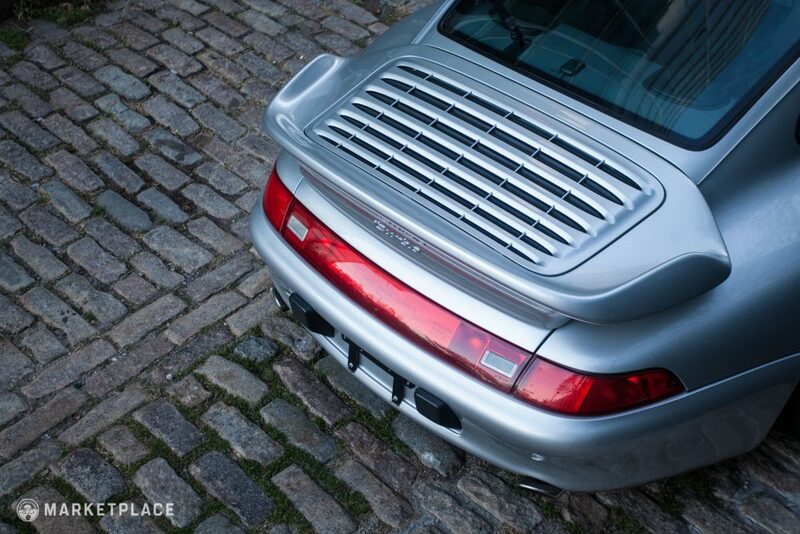 Still unmistakably a 911, especially in profile, the 993 Turbo was sleeker, wider, and more modern than ever before. 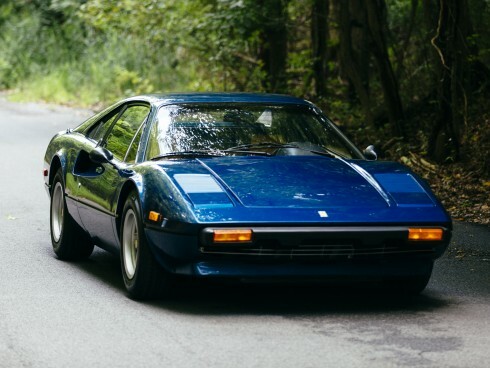 Teardrop shaped mirrors were fitted as standard along with 18-inch hollowed-out five-spoke alloy wheels mounted over enlarged Turbo-specific brakes for less unsprung mass. 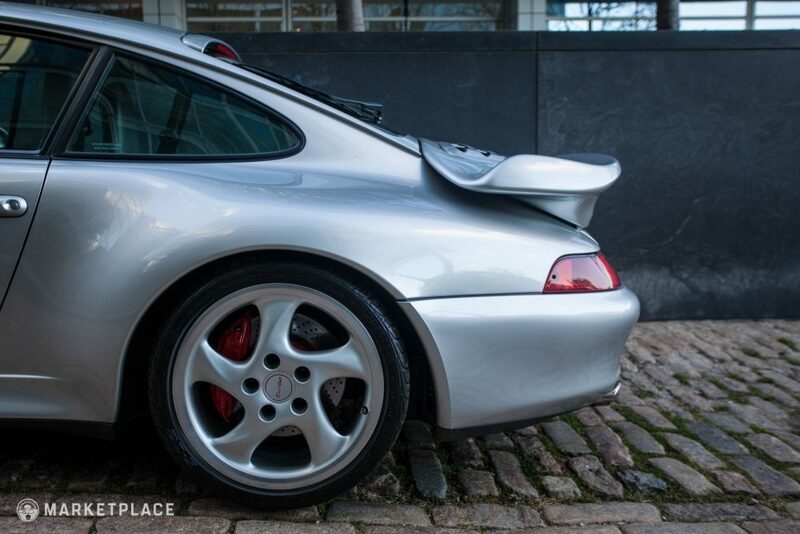 Turbo models also received wider rear quarter panels to accommodate the all-wheel drivetrain and the wider tread tires fitted for increased traction. 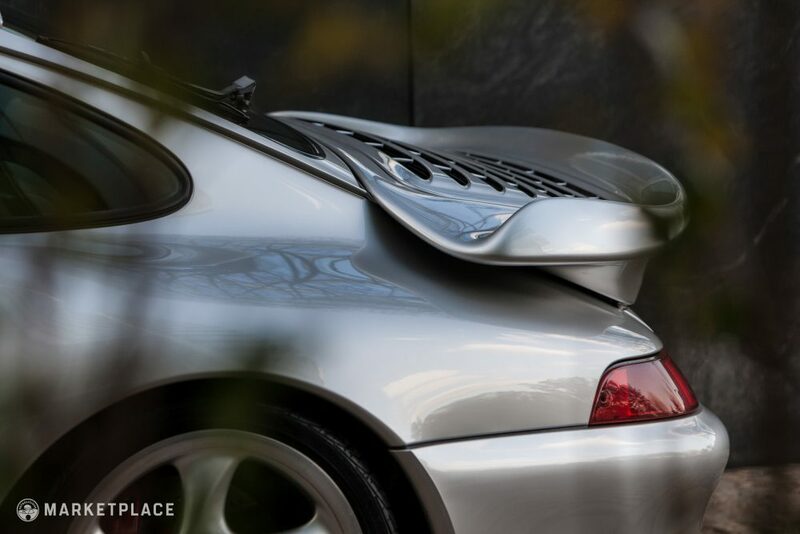 The front and rear bumpers gained added inlets for air channeling and a large Turbo-specific fixed rear deck lid spoiler with integrated intercoolers. 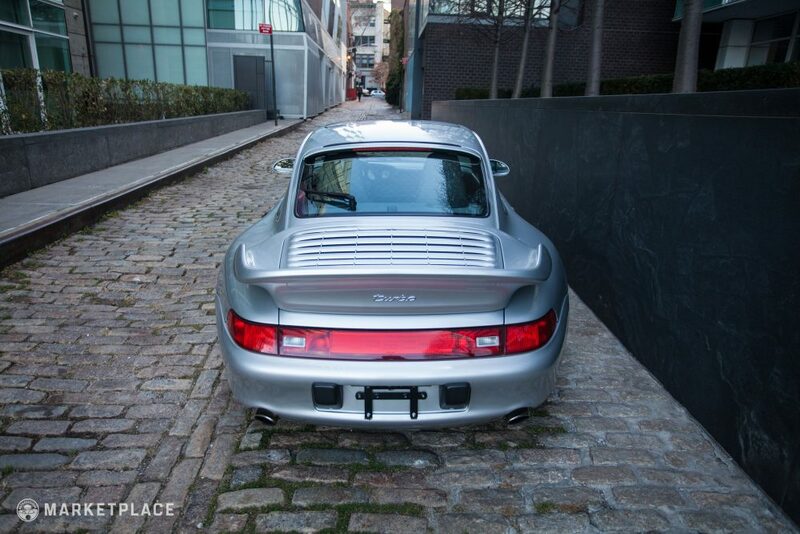 This 1997 Porsche 911 Turbo Coupe was is a 1-owner car that has been preserved with incredible restraint and care. 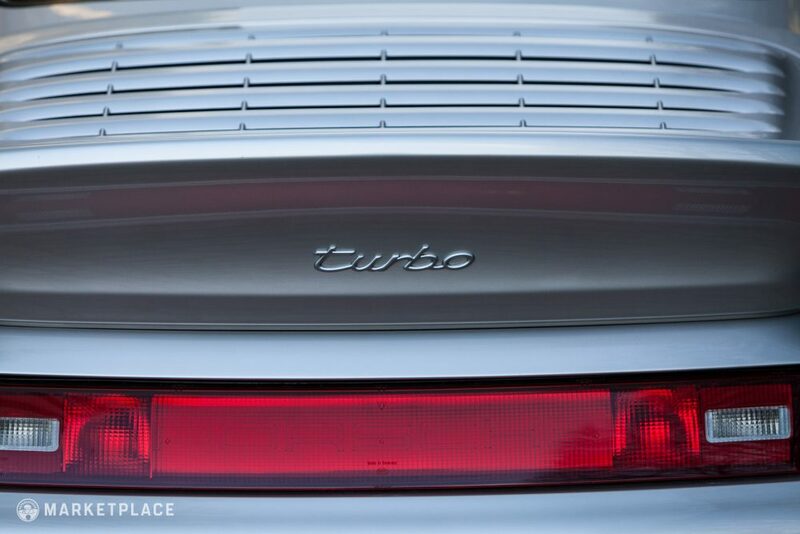 Displaying only 8,373 miles since new, this stunning silver-on-gray Turbo remains surprisingly fresh, timelessly beautiful, and incredibly quick even by modern standards. 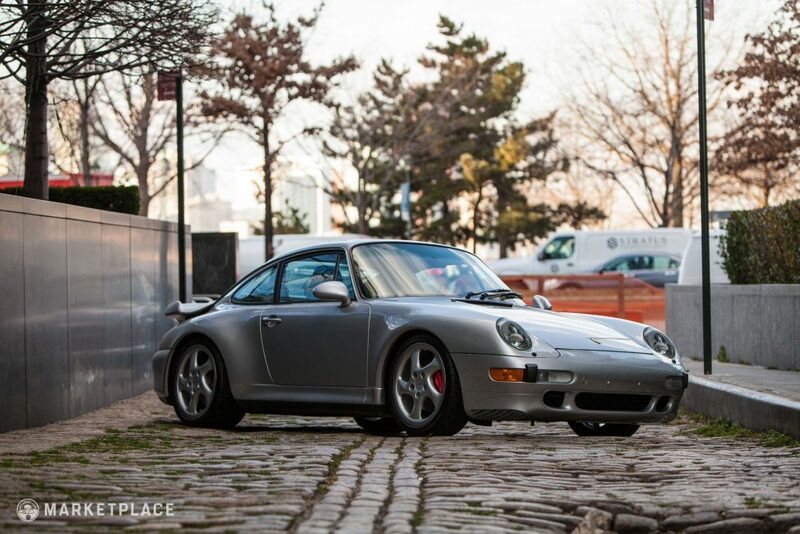 Still wearing its factory-applied Arctic Silver Metallic paint, the body panels, lighting equipment, and trim are entirely original and in like-new condition. 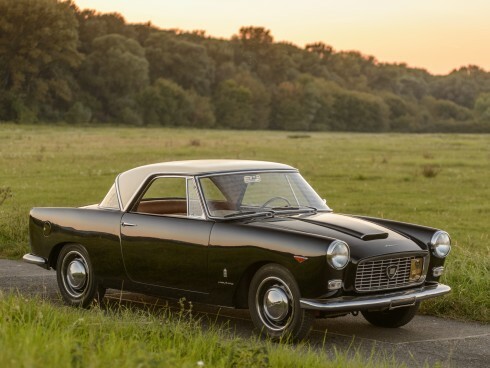 The body has been left unmodified from stock, all the way down to its factory five-spoke wheels. 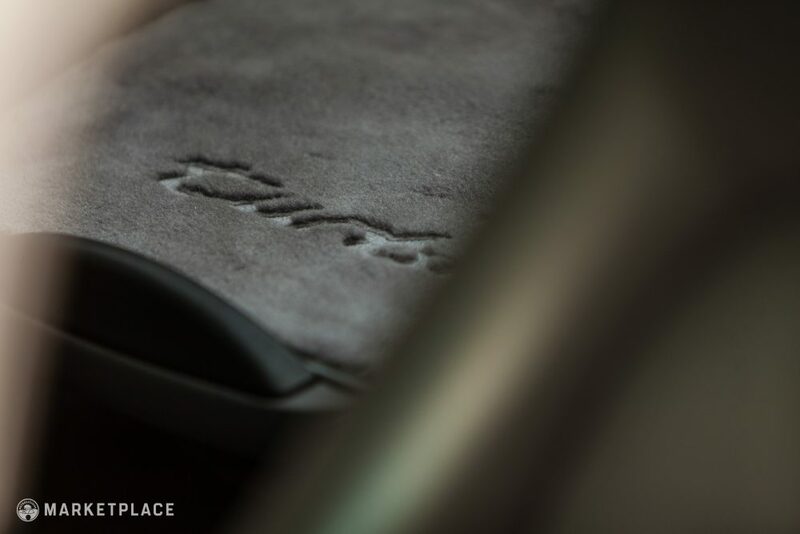 Inside, the cabin is equally tidy and was optioned with the luxurious factory Supple Leather package, Aluminum/Chrome trim, and classic charcoal floor mats. 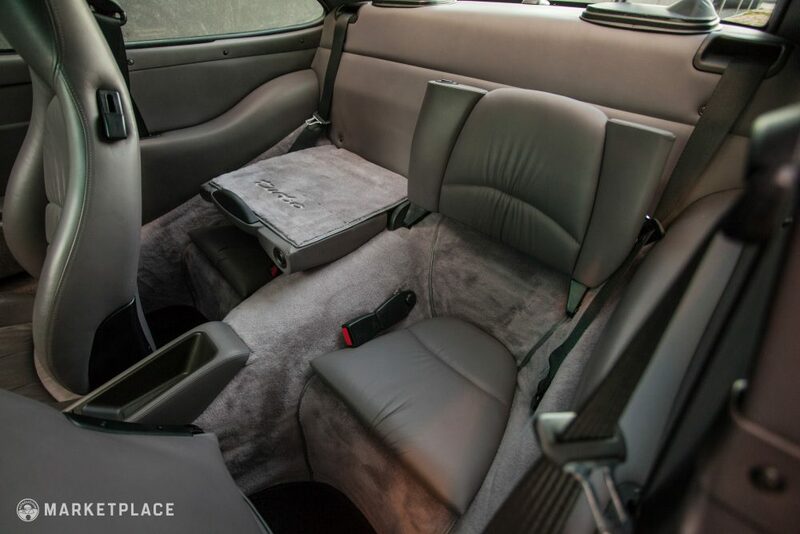 The Supple Leather package includes soft gray leather upholstered power front buckets with matching rear seats. 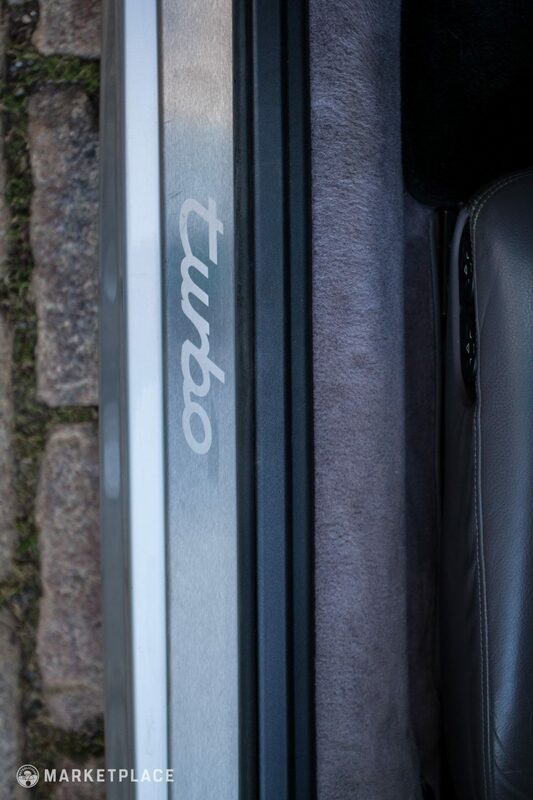 The polished “Turbo” scripted door sills are complemented with aftermarket Techart aluminum pedals. The only other modification to note is the in-period extensive audio upgrade. The factory head unit was replaced with a JVC KDAVX77 piece and matched to JVC Audio studio-grade amplifiers, a JL Audio Low-Drive subwoofer, a JL Audio sub amp (the original radio comes with the car), and Dynamat speakers all around. 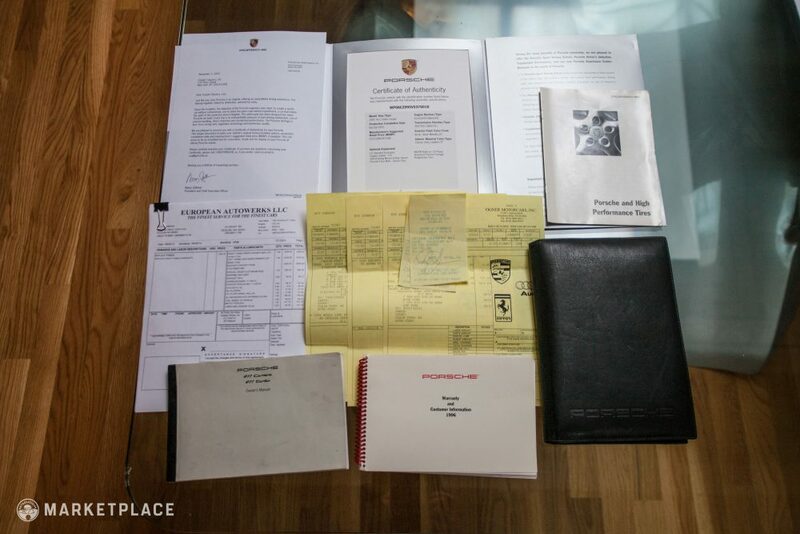 The audio invoices reveal more than $5,000 was spent on equipment and installation. 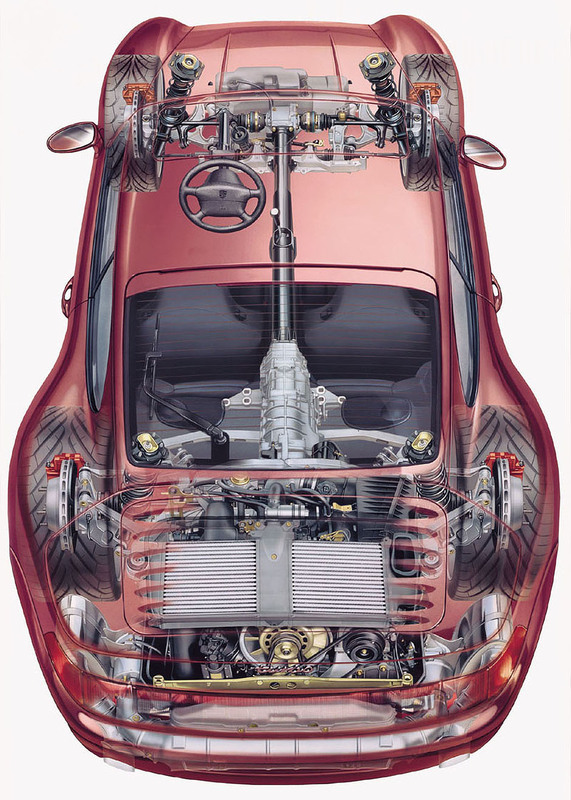 Body – The body retains all of its original panels. 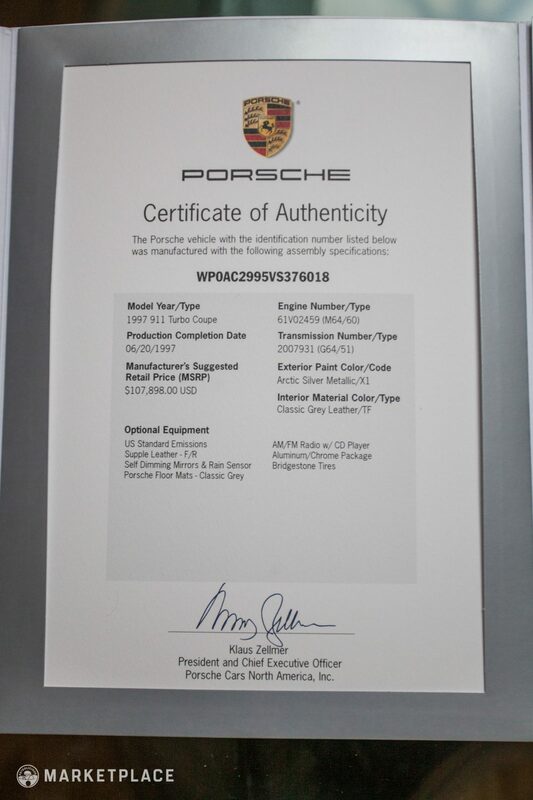 The car has never been involved in any accidents and is free of corrosion or other imperfections. Trim and Glass – All window gaskets, seals, and trim are original and free of sun damage, cracking, or peeling. 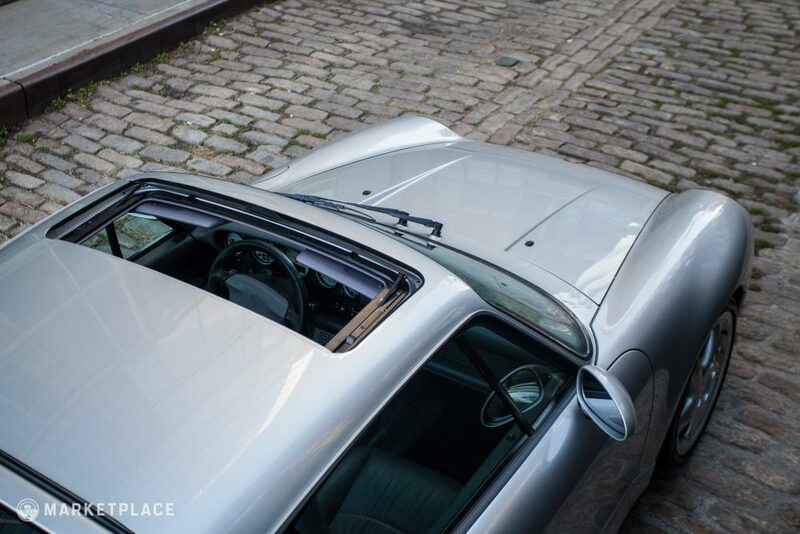 The greenhouse retains all its original Porsche glass, including the windshield. 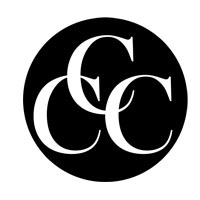 Wheels – Dramatic, hollowed-out, five-spoke blade-shaped aluminum wheels wear their original silver paint with only a few minor nicks incurred from typical use. 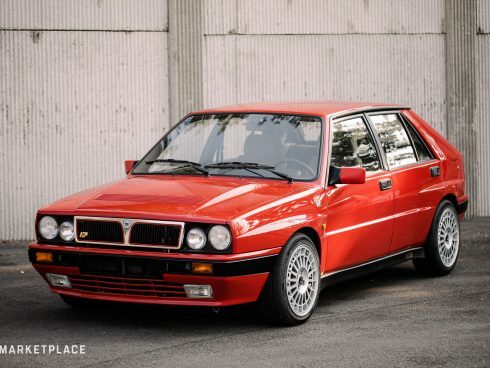 There are no curb marks, paint fading, or peeling issues, and the original embossed red script “Turbo” center caps are present. 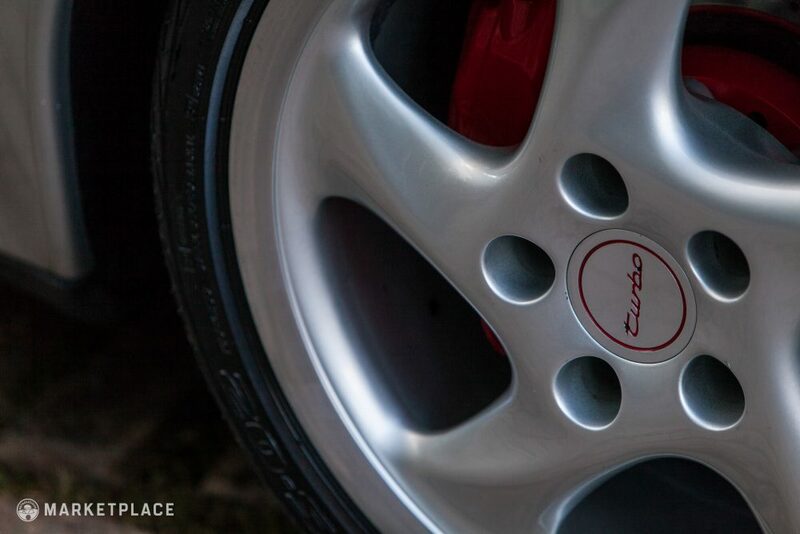 The calipers were ordered red from the factory. 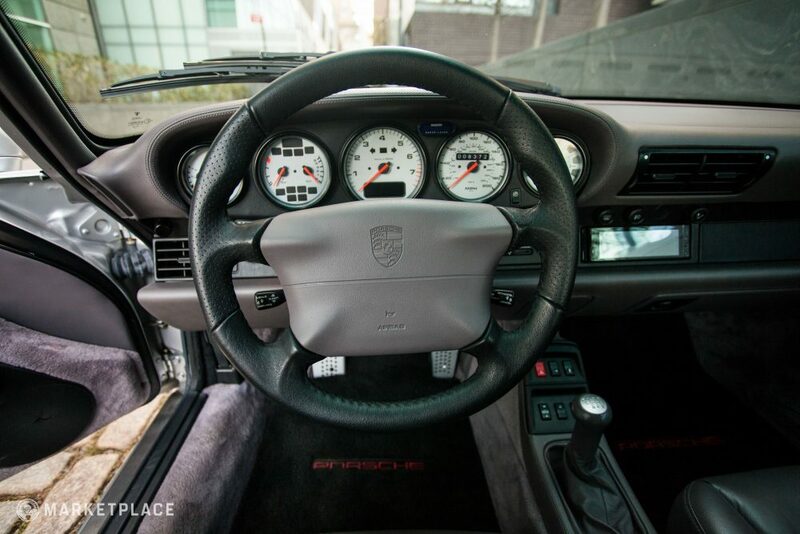 Steering Wheel – The original four-spoke, two-tone gray and black perforated steering wheel offers excellent padded grip and appears in like-new condition with no scuffs, discoloration, or visual wear—the same goes for the shift knob and surround. 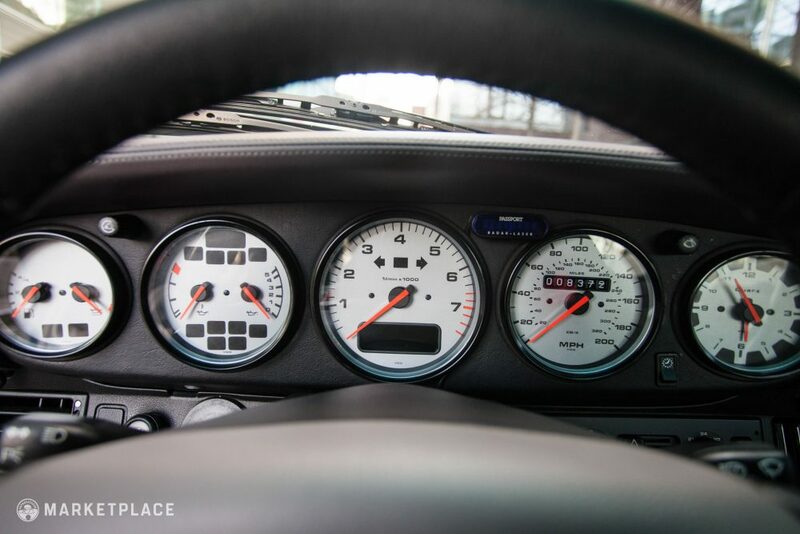 Dashboard & Instrumentation – The gray leather-wrapped dashboard appears in equally tip-top condition with no sun damage, shrinkage, or imperfections. The original instrumentation, switchgear, and HVAC controls are still in place and fully functional. 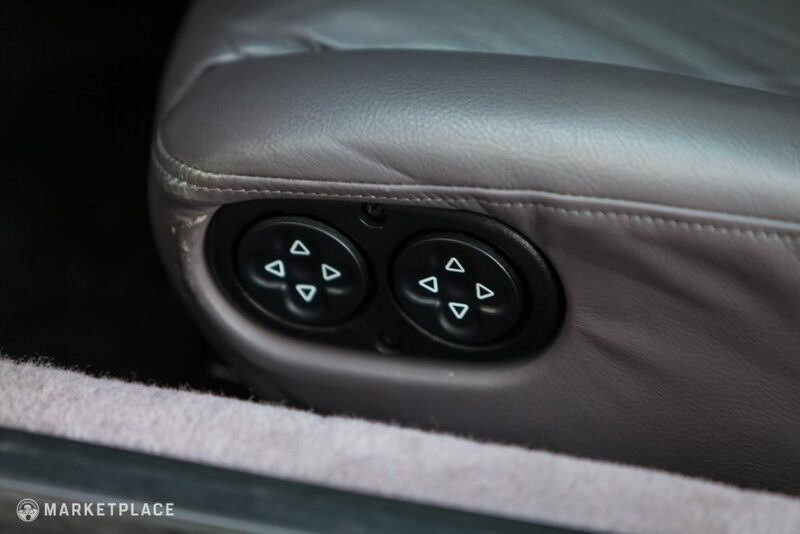 Seats, Trim, & Carpet – The Supple Leather package gray buckets are in exceptional condition with the only scuffs of note being just forward of the driver’s side power seat controls. 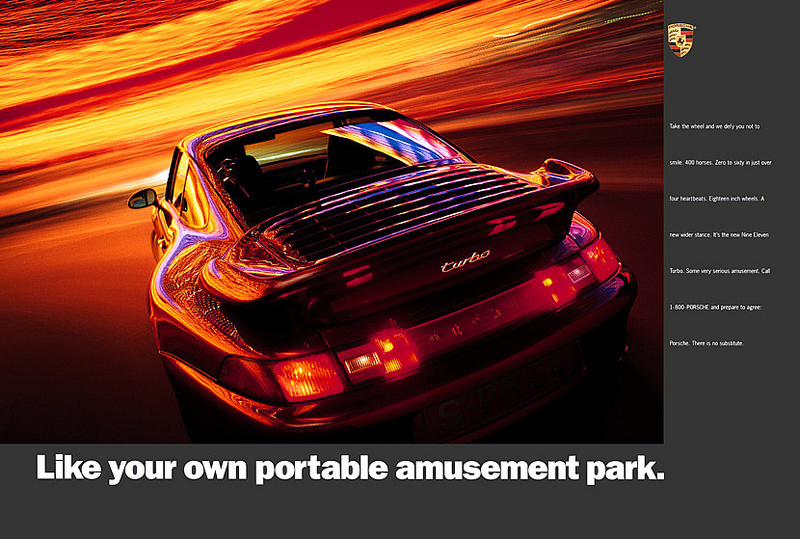 The rear seats appear like new as does the headliner, door panels, center console, and factory-optioned charcoal floor mats with red “PORSCHE” lettering. 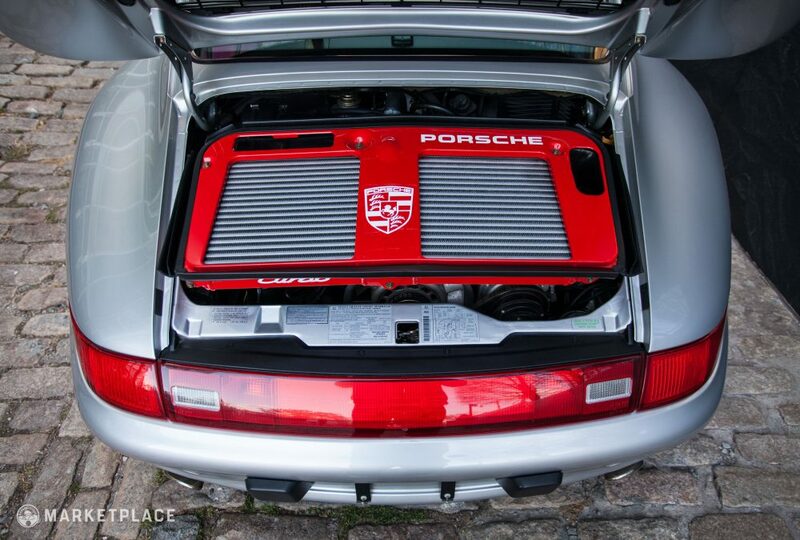 Engine – The original air-cooled 3.6-liter turbocharged flat-six engine remains unopened and is unmodified from stock. The intercooler was ordered in red from the factory. 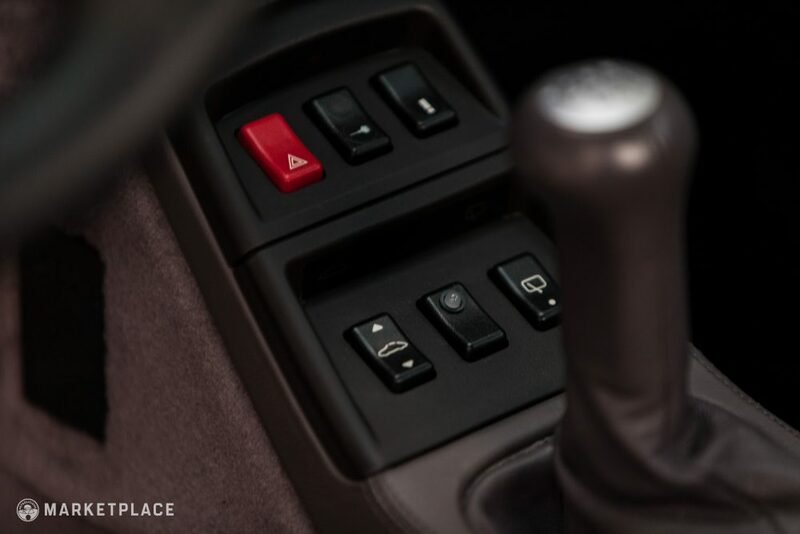 The Drive: The engine starts promptly, idles smoothly, and effortlessly delivers all 400hp+/400tq+ upon command. 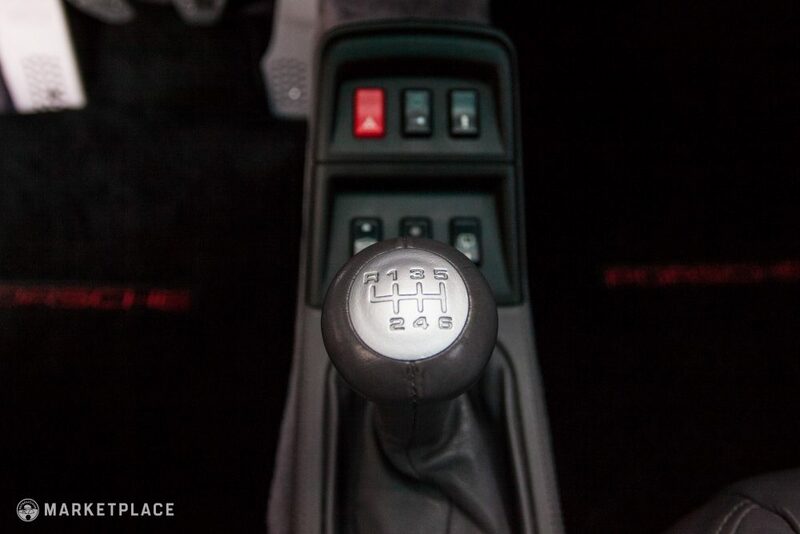 Transmission – The original six-speed manual gearbox is intact along with the original clutch assembly. 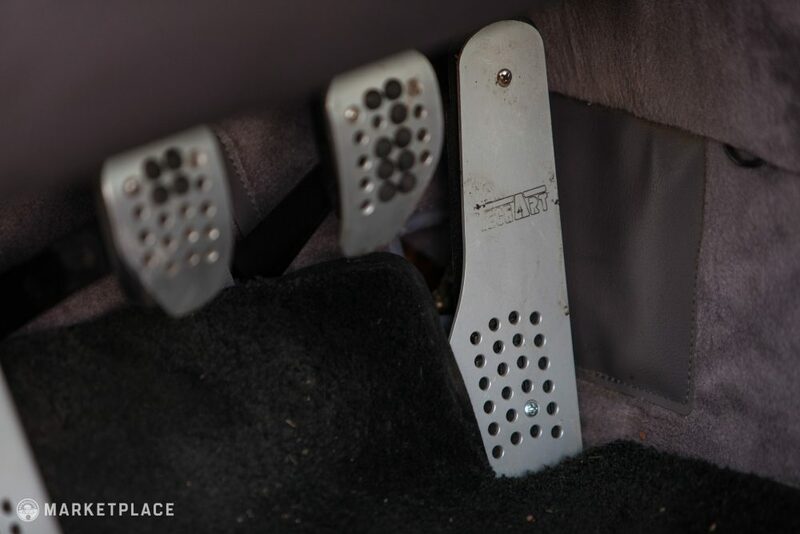 The Drive: The transmission shifts smoothly with easy and direct gear changes: no pop-out synchro problems or other issues are present. 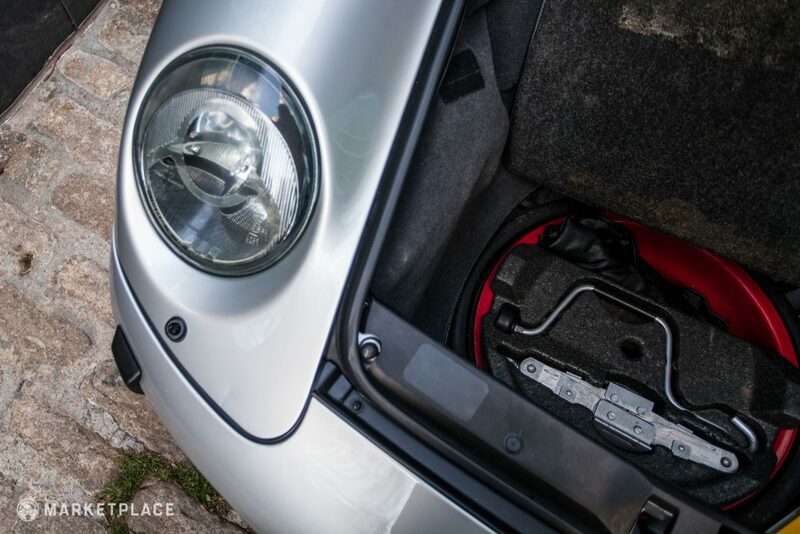 Handling – The suspension has been untouched since new along with the brakes and AWD system. 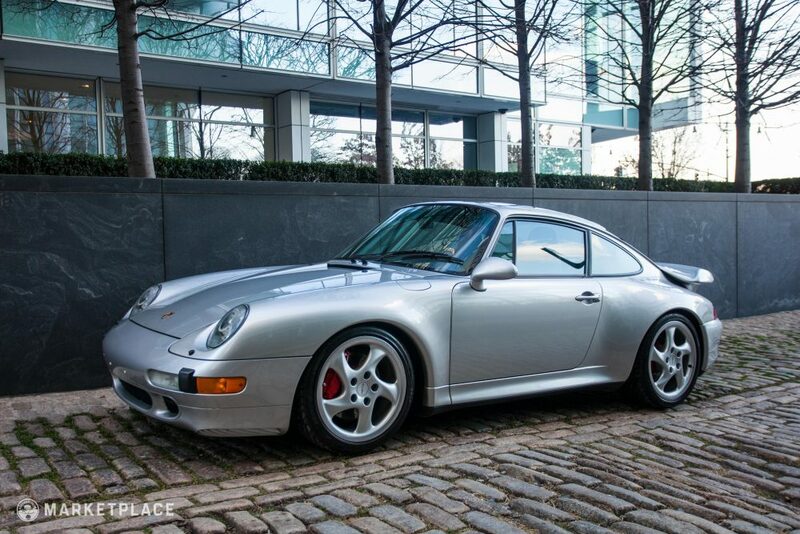 This car is entirely original to its factory specification with the exception of the period audio upgrade and Techart aluminum pedals. 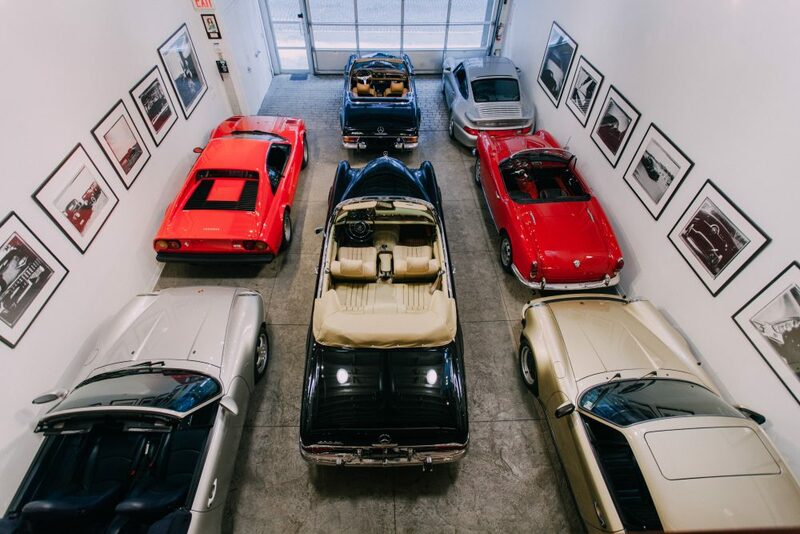 The body panels, paint, lighting equipment, trim, glass, emblems, and wheels are all original to the car and in excellent condition. The desirable Supple Leather package and Aluminum/Chrome trim upgrades are equally well-preserved and are great factory options to have. 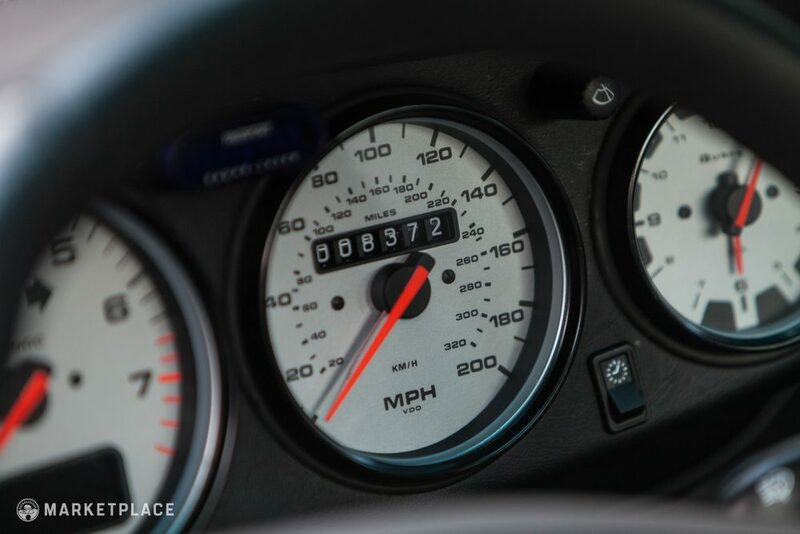 The sale includes the factory spare tire, owner’s manuals, window sticker, full service history, and aftermarket stereo upgrade equipment and install invoices. 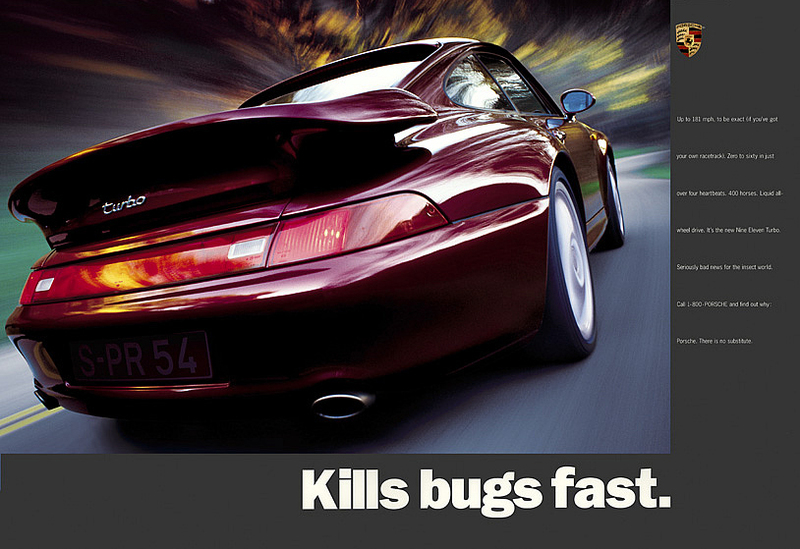 As per usual, a fantastic commercial by Porsche. 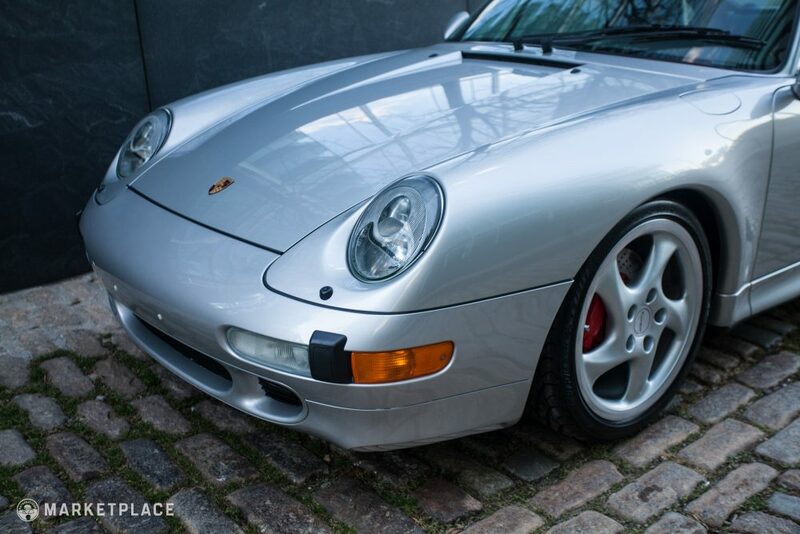 Low Mileage/Highly Original – With only 8,373 miles on the odometer, this 993 Turbo has unusually low mileage even within the collector tier. 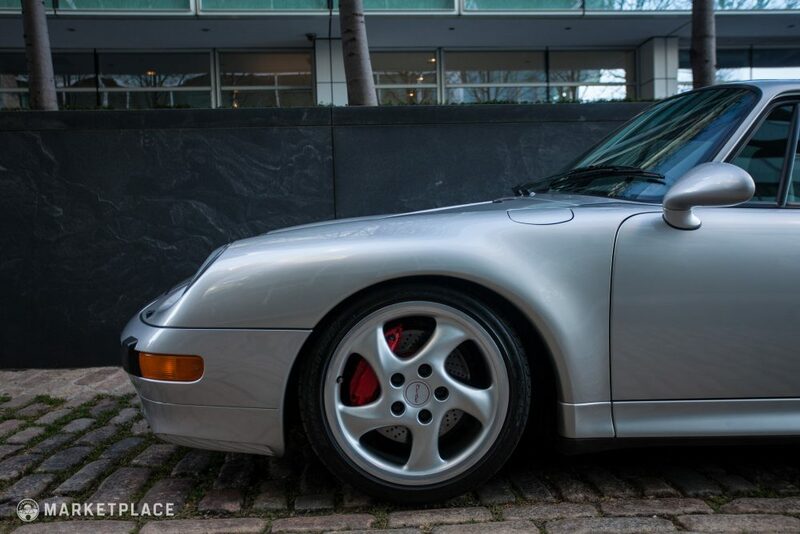 Visually unmodified and beautifully preserved, this pristine Turbo offers a rare opportunity to own what many consider to be the best 911 model ever produced. Classic Colors – Finished in Arctic Silver Metallic with a medium gray and black two-tone stitched leather interior, this color combination endures as a timeless look on what is certainly a bonafide modern classic.